Pete and I (Megan) have been making and selling Sculptures for over 7 years now and welcome any commissions or requests you may have. We love to create beautiful works that will complement and enhance your garden or outside area. Pete is a qualified Carpenter and has fantastic skills in turning wood into art and enjoys the challenge of new and exciting designs. Megan has been working as an artist in different mediums for many years and is now enjoying the strength and diversity of wood. 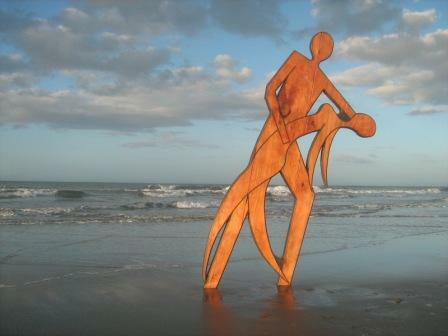 We live near a beautiful beach here in Whakatane and use it as a stunning backdrop for our works. All our pieces are made new to order from treated NZ pine coated in a quality furniture oil. They are all ready to place in your garden with either a metal pole in the base or a silver aluminium bar. They are designed to stay outside and we recommend that you re-oil your piece approx every 6 months with an exterior funiture oil to keep the wood from drying out. This can be done easily by ragging it on. We use British Paints Decking Oil in 'Kwila'. To order a piece or make an enquiry, please email us via our contact page or use the Buy Now buttons in the galleries which allow payment by credit card or internet banking. We are a web based business and our gallery is online. If you need any larger photos or infomation on a piece please email us and we will be happy to help. Also we have a "Sculpture Out and About" page to view works insitu. We can courier your piece to you or you are welcome to make arrangements to pick it up from us. Our standard courier costs are $20 North Island and $29 South Island.